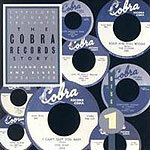 CD review: "The Cobra Records Story"
This two-CD box set is the third from Capricorn Records to highlight and capture the historic recordings of a small blues/R&B label. And, like the "Jewel/Paula Records Story" and "The Fire/Fury Records Story," "The Cobra Records Story" shows that some of the best blues recorded in the 1950s was on the small labels. The accompanying folio is beautifully illustrated; the recordings completely annotated. And the artists  well, they're what make this collection so noteworthy. It was one Willie Dixon who produced most of these sessions, and these were some of the first recordings made by such future luminaries as Otis Rush ("All Your Love (I Miss Loving)"), Buddy Guy and Magic Sam. And if not their first or most noteworthy performances, having Ike Turner and Sunnyland Slim is still a treat.